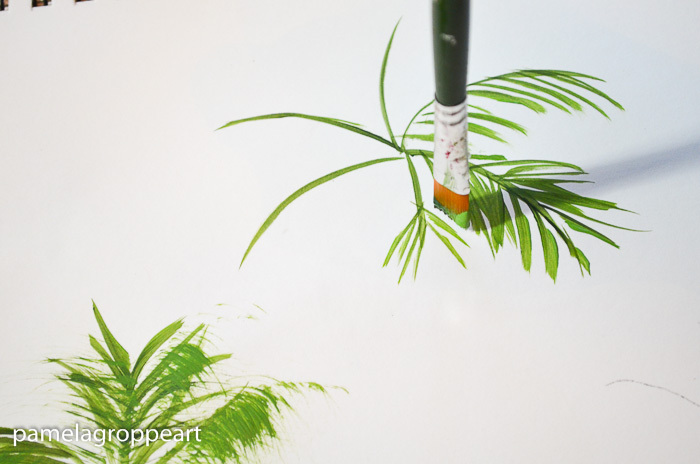 Easy Paint Palm Trees one stroke at a time. These are great to add to the beach scene tutorial for a full on tropical experience. Super simple for beginning painters and so much fun! 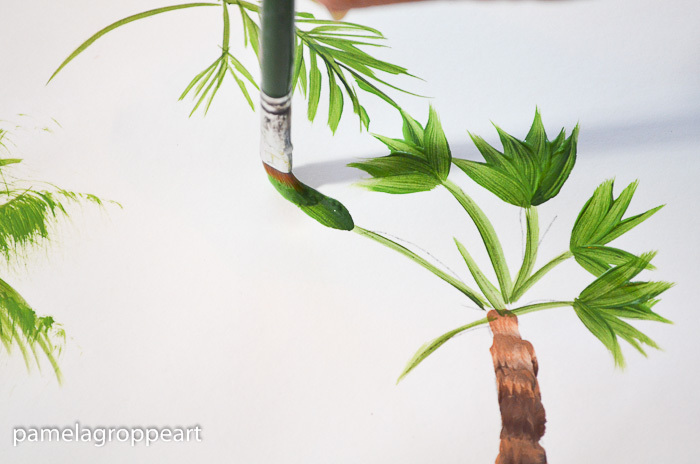 These easy paint palm trees are so beginner friendly and fun! 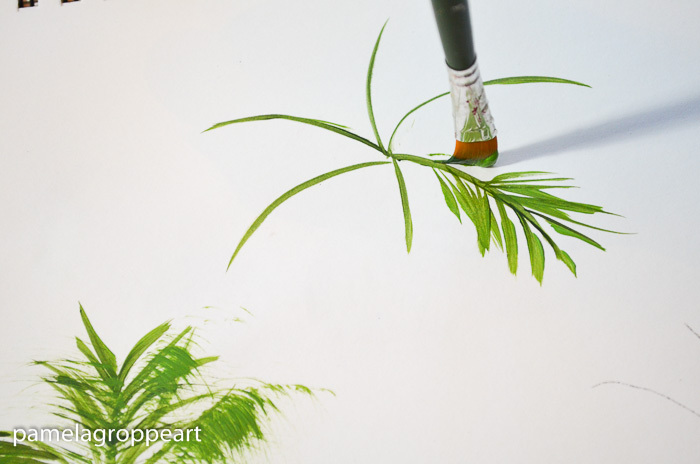 You can add these to the Paint a Beach Scene easily for a tropical canvas painting. 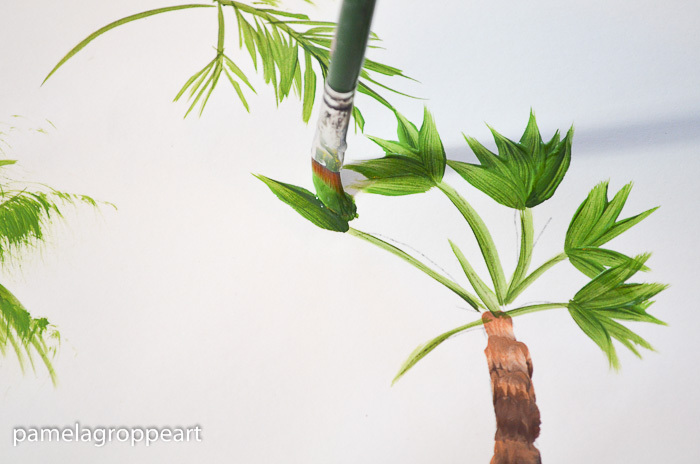 Palm Trees are fairly easy to paint. This post is for the Palm trees alone.. I painted this in my Canson Mix Media Pad. New here and need to know basic terminology and strokes? 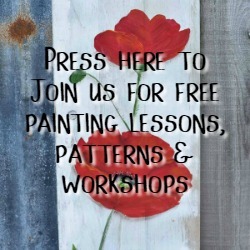 Click here for a quick and easy post on Basic Brush Strokes. Full length real time video is at the bottom of this post and a supply list. 1.Start with a quick sketch of the palms for a guideline, nothing fancy it just helps me to keep myself inline with the paint brush. 2. Double load the #12 flat brush with Burnt Umber and the lighter brown paint, in this one I used Coffee Latte and added a touch of Parchment to lighten as needed. Use a shortened slider leaf stroke and stack them on top of each other narrowing the size as you get closer to the top of the tree trunk. 3. Double load your brush with Thicket and Cut Grass. 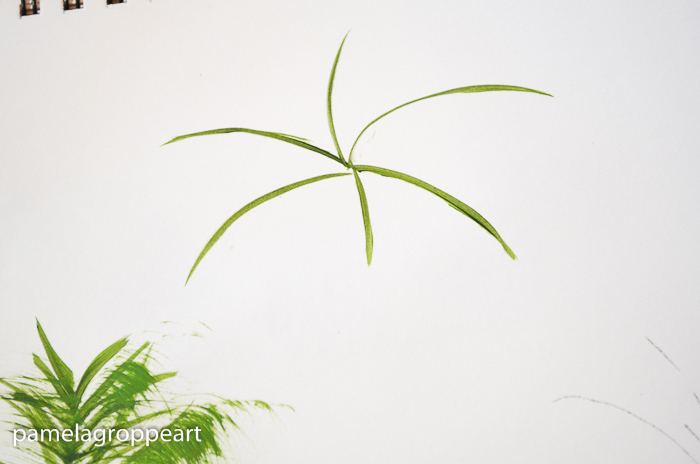 Paint in the spars for the palm fronds, it is almost a star shape. 4. Reload brush with the greens again. Add the palm fronds with shorter chisel edge slash strokes. Lead with the lighter green and tilt your brush back on its heal to make the strokes thin. Thinner than mine here, with the paper causing drag on my brush I used too much pressure, but in the long run it looked fine. I just know I can do better. Keep doing this all the way around the spars. Some of the fronds that would be facing down I only add the leaves to one side. The frond behind my brush is only painted on one side. 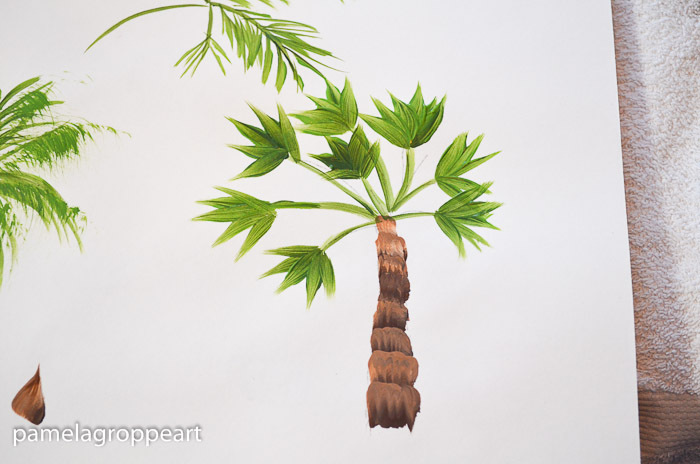 Somehow I failed to get a photo of painting the trunk of this palm but you can see it in my video included at the bottom of this post. It is a short wiggle stroke stack on top of one another from top to bottom, graduating in size to its widest point at the base. 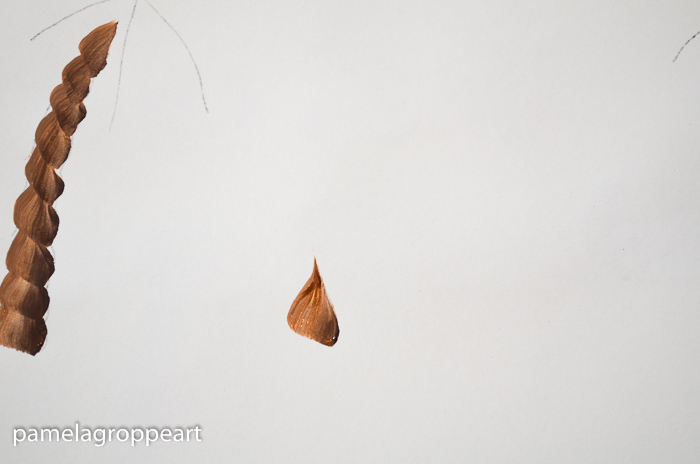 The fan shaped leaves are a chisel edge slider stroke on the ends of the various length stems. 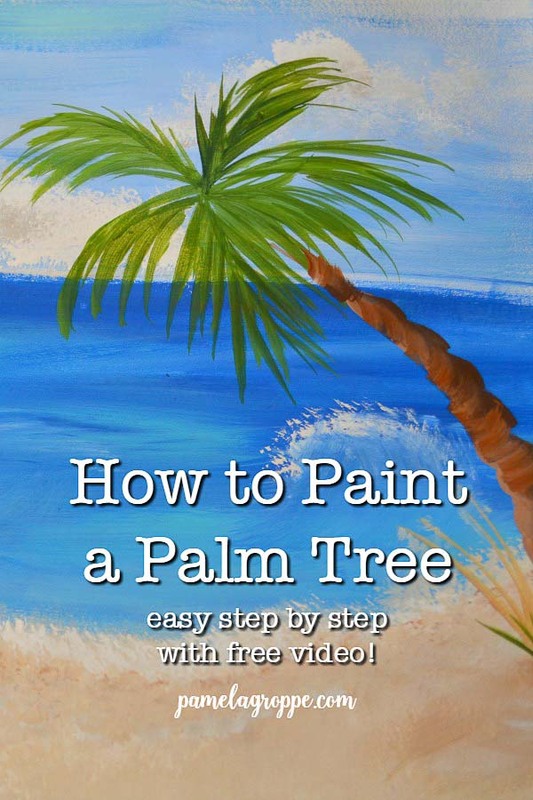 I need to redo this tree and make a completely new tutorial for it but in the mean time, this one is pretty to add to your tropical beach painting. You should end up with something resembling this. Don’t worry about being exact. Remember we are going for an impression of something and not reality. 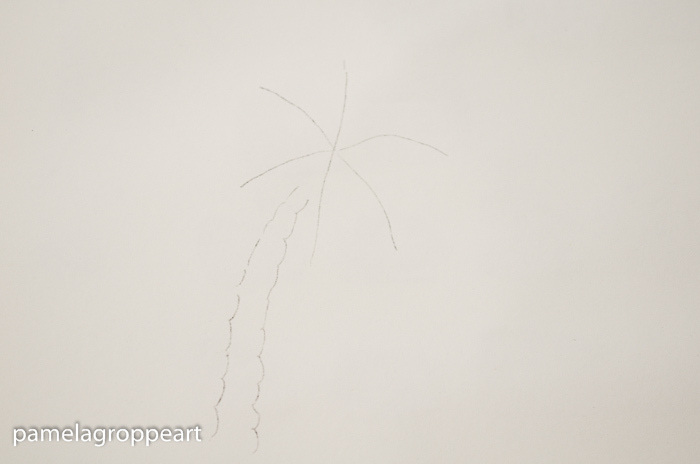 Just have fun with it and paint easy palm trees one stroke at a time! It is easier to see what I am talking about in the video. Sorry for the poor lighting, we have not had sunshine in over a week and the difference natural light makes is amazing. Note: The paint colors should be available at your local craft supply like Michaels, JoAnn’s or Hobby Lobby. Many times they run great sales so watch their flyers. Love your beach theme. I am presently painting Cardinals on the seat of a foot stool, custom built by myself, I have included White Birch trees (Aspen) in this version instead of pine branches and pine cones. Just a note to say I have used your recipe for Cherry Scone recently and replaced the cherries with Fresh Cranberries, Almond extract and White chocolate chips. They were so good, I made a second batch using fresh blueberries and cranberries because the 1st batch got used up pretty fast. 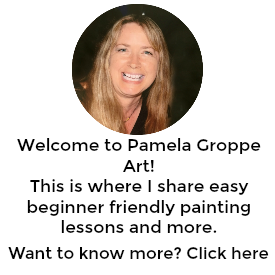 Thank you for sharing and keep up the good work.